Dogs are notorious for eating things they shouldn’t, and many of those things are not necessarily food. Dogs can chew and gulp down almost anything. So, if your dog ate a sock, you’re not alone — it’s a commonly swallowed item. What are your next steps to take if your dog ate a sock? Photography ©Barna Tanko | Thinkstock. When dogs swallow items they have no business swallowing, several things might happen. If the dog is big and the item is small like a sock, the dog might simply vomit it back up — either right away or a day or two later. If that doesn’t happen, it’s possible that the dog might pass the sock and eventually poop it out. This could take several days, and you will want to take a close look every time your dog poops to check for the sock. What If You’re Not Sure If Your Dog Ate a Sock? Because some types of items are difficult to see on an x-ray, and because dogs sometimes swallow things without their owners realizing it, your veterinarian might elect to take a look at the stomach with an endoscope. “Sometimes, I go down there with a scope because I think they have bowel disease or chronic inflammation, and I say, ‘Oh! Look, there’s a ball down here!’” Dr. Diehl says. One outcome you really hope to avoid is an intestinal obstruction, where the sock lodges somewhere in the intestines, causing a blockage. An obstruction is serious and it requires surgery to remove the item. The tricky thing about intestinal obstructions is you might not realize your dog has one if you didn’t actually witness him swallowing a sock or something he shouldn’t. If you were lucky enough to witness your dog swallowing a sock or other item, one option is to bring him directly to the veterinarian to see if the item can be removed from the stomach with an endoscope. This is an especially good option if your dog is small and the item is large. “One thing about socks in the stomach is they’re really easy to pull out with an endoscope,” Dr. Diehl explains. “It’s going to cost you some, but it’s less expensive than a surgery. Once they get in the intestine, it’s a problem because you can’t get a scope down that far and then they can swell from the gastric and intestinal juices and they can get stuck.” Your regular vet might be able to remove a sock with an endoscope, but if not, he or she can refer you to a specialist who does endoscopy. According to Dr. Diehl, many dogs, especially large dogs, will either throw up socks or pass them in their stool. If your dog is not acting sick and isn’t throwing up, one option is to wait and see if it comes out on its own. If you don’t see the object come out in a few days, or if your dog starts acting sick, it’s time to see the vet. 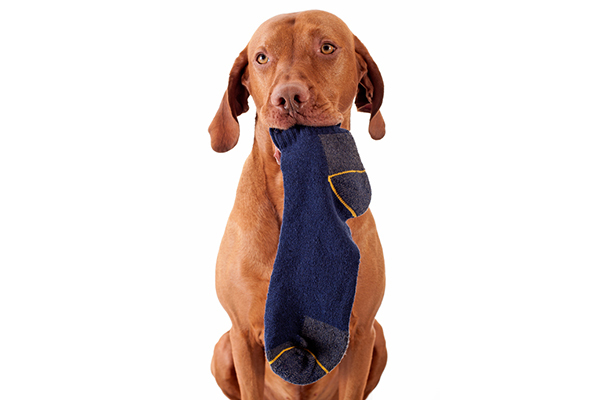 Did Your Dog Swallow a Sock … Or Another Object? Not sure if your dog ate a sock — or something else? Photography ©CreativaImages | Thinkstock. If you’re not sure whether your dog ate a sock or another inappropriate item, but you notice telltale signs of an obstruction, go to the vet to have him checked out. “If your dog starts vomiting profusely, especially if he’s not eating or drinking, and he just keeps vomiting and vomiting, that’s often a classic sign of obstruction and that’s definitely a medical emergency,” Dr. Diehl explains. “Additionally, if your dog isn’t typically a barfer, but starts vomiting several times a week, it could be because something is stuck in the stomach. If your dog swallows a sharp object, a battery or a very large object, see the vet immediately, as these types of objects may cause serious problems. And if your dog swallows underwear, take him in to try to remove it with an endoscope before it gets to the intestine, where the elastic band can cause problems. Thumbnail: Photography ©dosecreative | Thinkstock. This piece was originally published on December 7, 2017. 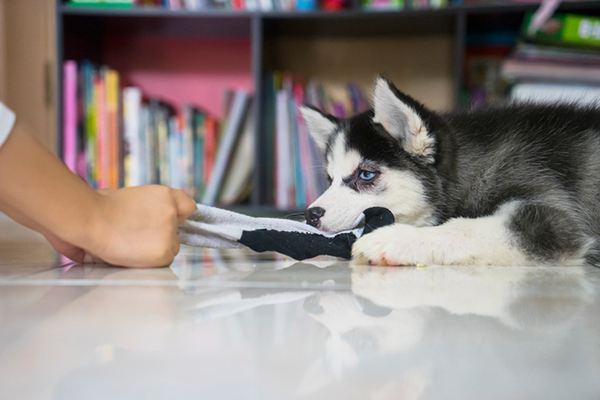 The post Your Dog Ate a Sock — What to Do Next appeared first on Dogster.